Whether we are monastics or lay practitioners. A monastic mind comes from a heart that is humble, receptive, kind, compassionate. A monastic’s mind is inquisitive, sincere, eager to learn, and wise. It doesn’t come automatically when we take ordination. We develop it throughout our lives. Nuns and monks study to learn Buddhist scripture, but that’s not all. We also meditate on them and live them as best we can. As we try to embody the teachings on compassion and wisdom, the Dharma becomes alive in the world. It is expressed by our body, speech, and mind in our interactions with others. All practitioners—ordained or lay—can benefit from developing a monastic mind. Having a “monastic mind” benefits our Dharma practice whether we are monastics or lay practitioners. 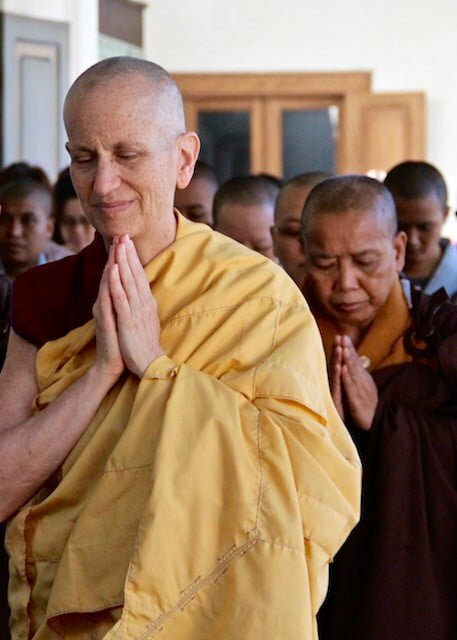 A monastic mind is one that is humble, imbued with the Buddhist worldview, dedicated to cultivating mindfulness, clear knowing, love, compassion, wisdom, and other good qualities. Being mindful of the kindness I have received from all sentient beings, I will relate to them with patience, kindness, and compassion. I will be mindful of my precepts and values and will cultivate clear knowing of my thoughts and feelings, as well as how I speak and act. I will take care to act and speak at suitable times and in appropriate ways, abandoning idle talk and disruptive movements. With respect for others and confidence in my good qualities, I will be humble and easy for others to speak to. In all these activities, I will endeavor to remember impermanence and the emptiness of inherent existence and to act with bodhicitta. Ahimsa, or non-harmfulness, is an essential Buddhist virtue. We practice it in the Abbey by not harming each other or any living being physically, verbally (through unkind speech) or mentally (through malicious thought, holding grudges, or retaliating). This entails developing our capacity to listen to each other with compassion and to communicate kindly. This is the heart of practicing the Dharma with the people we live with in community. We also practice non-harmfulness by being vegetarian—no meat, chicken, fish, or fertilized eggs—because we wish to preserve life. Hunting is not permitted on our land. We developed a forest management plan to protect the environment and the animals living there, so that all can live peacefully and in safety. We are committed to sustainable, ecologically friendly construction, making choices that are kind to the environment and the beings that live in it. We recycle and re-use items to protect future generations from environmental pollution and misuse of resources. We conserve water and fuel. This is an expression of non-harmfulness and compassion for future generations and for the wildlife with whom we share the land. Living together as a community is part of our practice of compassion. Community life has its blessings and its challenges. We receive the support of like-minded people on the spiritual path. These Dharma friends understand our spiritual aspirations and encourage us to practice by practicing themselves. Together we create a peaceful atmosphere in which Dharma is lived and people are valued. On the other hand, we may have different ideas, preferences, and ways of doing things. By living in community, we learn give and take. We live with others and cannot do everything the way we like. We have to give up some of our preferences for the larger group to function smoothly. We have to soften some of our opinions and ways of expressing them to live harmoniously with others. Some have habits that annoy us; we must learn to cultivate tolerance and compassion for them. Furthermore, we are not Buddhas. We still suffer from ignorance, anger, and attachment, and these afflictions sometimes color our relationships with each other. In community, it’s impossible to continue the habit of blaming others for our own unhappiness. We must take responsibility for our emotions, learn to work with them skillfully, and learn to express them to others kindly and honestly. In the process of doing so, we develop “transparency,” the ability to admit our mistakes and weaknesses without feeling ashamed or guilty. We develop confidence by working through problems. We cultivate compassion, knowing that our companions also suffer from disturbing emotions, and practice patience with them, supporting them as they work through their difficulties. To become bodhisattvas, we must cultivate patience and compassion for both others and ourselves. Living in community provides an opportunity for us to do so. But this is not an easy path. Since we want to become bodhisattvas, we must train to bear hardships with a happy mind, thus transforming difficulties into Dharma practice. The monastics of Sravasti Abbey endeavor to live generously through dedicating our lives to the Buddha’s teachings, practicing them earnestly, and offering them to others. We trust that people will value our way of life and work and will respond generously by providing what is needed to live and to spread the Dharma in a modern society. 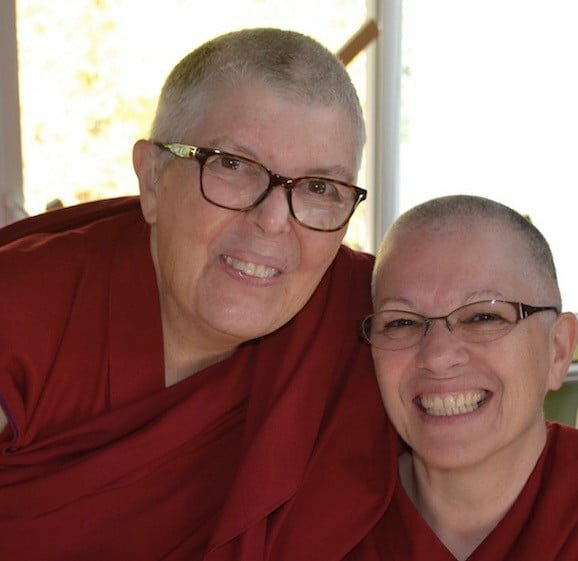 Since monastics live simply, what we have to offer is the Dharma—the Buddha’s teachings. The Buddha said that the giving of the Dharma is the best kind of giving, because it leads others on the path to liberation. When monastics from the Abbey teach, whether at the Abbey or at Dharma centers, we do not charge a fee. We give Dharma freely from our hearts because we want to benefit all those who attend. This gives us the freedom to teach wherever we think it is most beneficial without having to worry about earning a livelihood. Lay teachers who have families and a householder’s lifestyle do not always have that freedom. Thus we avoid selecting where to teach based on the amount of offerings we might receive, and we do not charge for services such as private interviews for spiritual consultation. As monastics, we give all this freely. We trust that those who benefit will want to help support us with the necessities we need for living so we can continue our spiritual practice and beneficial work. The Abbey also freely provides some of Ven. Thubten Chodron’s books to those who visit the Abbey. We want to share the Dharma with people whether they have funds or not. We also send books and Dharma videos to inmates and to third world countries free of charge. However, since we must purchase these books from the publisher and pay for tape duplication, we gratefully receive donations to continue with this service. Abbey monastics offer service to the sangha community by the work we do at the Abbey each day. We offer service to the broader Buddhist community by teaching the Dharma, transcribing and editing teachings, doing spiritual counseling, and performing blessing ceremonies after the birth of a child and the death of dear ones. We offer service to those in need by doing prison work and by counseling those who are ill. We offer service to society in general by writing books and by giving public talks, lectures in schools, and so forth. Lay followers also offer service by doing volunteer work for the Abbey. The Abbey, in fact, is completely dependent on volunteers. Some people do volunteer work for the Abbey from their home. Others come to the Abbey for work parties, where they have a good time working together with others and creating community. Mindfulness entails being aware of our precepts, values, and practices and living according to them as much as we can. For example, by being mindful of our precepts, we are attentive to act according to them. Being mindful of love and compassion, we bring those attitudes into whatever situation we are in and whomever we have contact with. Being mindful of emptiness, during our daily life we contemplate our interactions, acknowledging that we, the action we are doing, and the people and things around us are all empty of true existence, but exist on the conventional level as appearances. To be mindful, we must slow down and be more attentive to what we are thinking, feeling, saying, and doing. We also want to cultivate mindfulness of and sensitivity to others’ needs. Participating in community life is part of the Abbey’s cultivation of mindfulness and compassion. Because we care about others, we practice doing our work with joy, without simply rushing through it at the last minute to get it done. To do this, we try to assess how much time is necessary to do a task and give ourselves enough time to do it in a mindful and relaxed way. Our mindfulness and compassion manifest in other ways too. For example, we follow the daily schedule, knowing that others value our energy and participation. 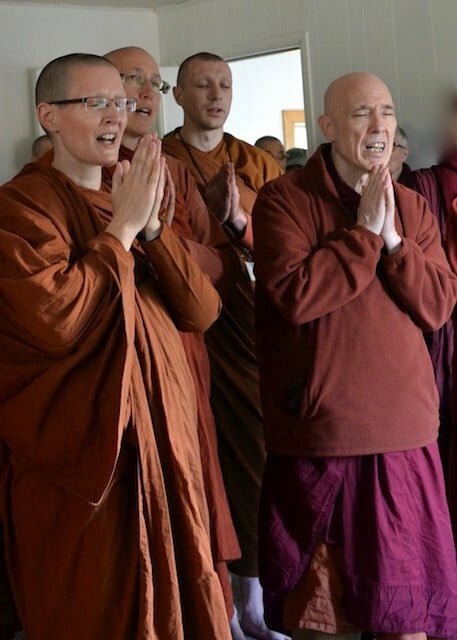 Not only do we need the support of the sangha, but the sangha benefits from our support, as well. We have something to contribute to others that is missed when we’re absent. We also endeavor to arrive promptly for group activities, because we know that late arrivals often create noise that disturbs others. How we move is also an expression of mindfulness and compassion. We become mindful of how we walk, showing our internal joy through gentle steps. If we walk with heavy steps—our mind being at the place we’re going while our body is still on the way—we put certain energy into the environment. In addition, the noise of clomping steps disturbs others. Our mindfulness extends to how we open and close doors. We want our companions to have a peaceful environment free from sharp sounds. Our mindfulness and compassion motivate us to clean up after ourselves, because we care about the people with who we share the environment. Thus returning things to their proper place, cleaning up the bathroom after using it, emptying the garbage, and other small daily life activities become part of our Dharma practice. Speech is another area where mindfulness and compassion are important. While it may be difficult to reverse some habits of speech such as being sarcastic or critical when we’re angry or humming when we work, we continue to cultivate mindfulness of our intention to speak truthfully, kindly, harmoniously, and at appropriate times. We practice thinking creatively about appropriate ways of expressing our feelings and ideas so that we communicate in a way that other people can hear what we’re trying to say. Practicing mindfulness and compassion in our daily interactions at the Abbey prevents our bodhicitta meditation from becoming abstract. It’s comparatively easy to love and feel compassion for those who are hungry or cold in other countries. Without too much distress, we may visualize giving our possessions, and positive potential to all infinite sentient beings. But caring about the few people around us when that entails giving up some of our own habits and wishes challenges our self-centered attitude much more. Because community life provides these opportunities, it can enhance our mindfulness and compassion and strengthen our Dharma practice in a way that living comfortably alone cannot. When we are grateful for the goodness around us and respect others’ excellent qualities and beneficial deeds, our own hearts open and we can progress on the path. Gratitude and respect cannot be forced. We can’t make ourselves feel them, nor can others demand them from us. Rather, they are traits that we consciously cultivate because we see their benefit. As we cultivate gratitude and respect, we naturally express them in our lives. Gratitude is cultivated by reflecting on the kindness of the Three Jewels, our spiritual mentors, Dharma companions, parents, and all sentient beings. This naturally gives rise to a sense of appreciation for having them in our lives and a wish to repay their kindness. Training ourselves to recognize others’ good qualities develops respect. This not only frees us from the judgmental, critical mind, but also inspires us to cultivate those same good qualities in ourselves. Meditation on these two topics—the kindness and benefit we have received from the Three Jewels and sentient beings, and their good qualities—is part of the basic monastic training at the Abbey. Appreciation and respect for others is shown through our behavior. We bow to the Three Jewels when entering the meditation hall. We do a half-bow to other members of the community when we first see them each day. We greet visitors to the Abbey with our palms together. By remembering their Buddha potential and respecting that quality, we also recall our own Buddha potential. Rejoicing in our own and others talents, good opportunities, knowledge, abilities, and positive potential is essential for having a happy mind. Through it we also create great positive potential that enhances our practice. Needless to say, those around us benefit when we directly express our joy in their good qualities and actions to them. This is a practice we try to cultivate in our daily interactions, and we also incorporate this more formally as a group practice in our bi-monthly ceremony. Just as grass doesn’t grow on the top of a mountain but in the fertile valley below, Dharma realizations grow not in the mind of an arrogant person but in the minds of those who are humble and willing to accept instruction. Humility is different from low self-esteem, for it is based on self-confidence. Because we are confident and like ourselves, we don’t have to prove ourselves to others, dominate them, or have the last word in a discussion. His Holiness the Dalai Lama is an excellent example of someone who is humble and respects all others. We show respect for those who are senior in ordination and those who are more experienced in the Dharma through following their good example and taking their advice to heart. These practitioners are a reliable support for us when we experience difficulties or doubts in our spiritual practice. Often, they have gone through similar challenges in their own practice and have learned through experience how best to work with the mind. Turning to them with humility and respect for their training relieves us from ego’s pressure to be the best, to know the most, or to be able to figure everything out on our own. Being able to accept feedback gracefully shows respect for our teachers and our companions on the path. When teachers or senior monastics remind us to be mindful of our actions, we practice listening and take in their comments with an open mind. When our minds tighten and we become defensive, as will sometimes happen, we practice noticing this and remembering that others’ comments are offered with care for our well-being and are meant to help us. We remember that the goal of Dharma practice is not to make our self-centered mind comfortable, feeding our ego everything it desires. We’ve been doing that since beginningless time, and it hasn’t gotten us anywhere. Now we practice relaxing habitual defensiveness. When well-meaning people give us feedback, we listen. If someone is upset when they give us feedback, we remember that they are expressing their suffering and give them space. Practicing this is the way to develop humility. When giving feedback to others, we first check our own minds to make sure we are speaking with kindness. As practitioners we want to stop ourselves from angry outbursts or from speaking seemingly sweet words that mask a spiteful motivation. When another’s behavior disturbs us, it is often helpful to wait a day to comment on it. That gives time for our mind to settle and for us to clarify our motivation. We may also choose to wait and comment on it during the community gathering prior to sojong (the bi-monthly ceremony in which monastics confess and restore their precepts).